BACKGROUND AND PURPOSE:Arteriovenous malformations (AVMs) of the spine or spinal cord can be characterized as spinal cord AVMs, spinal cord and dural arteriovenous fistulas, and AVMs occurring outside the dura but draining into the epidural veins. The purpose of this study was to review the clinical spectrum, imaging features, and results of treatment of paravertebral arteriovenous malformations (PVAVMs) with epidural drainage. METHODS: The clinical records and images of 10 patients with PVAVMs were analyzed retrospectively for clinical presentation, MR findings, angioarchitecture, pathophysiology, treatment efficacy, and clinical follow-up. RESULTS: Seven patients had myelopathy. The MR findings for three of these patients showed spinal cord hyperintensity on T2-weighted sequences and prominent perimedullary vessels. Angiography, performed in two of the three patients, showed evidence of reflux into the perimedullary veins from the PVAVMs. Each of these two patients underwent surgical clipping of the radicular vein leading to the perimedullary veins. In three of the seven patients, there were large epidural veins compressing the cord. 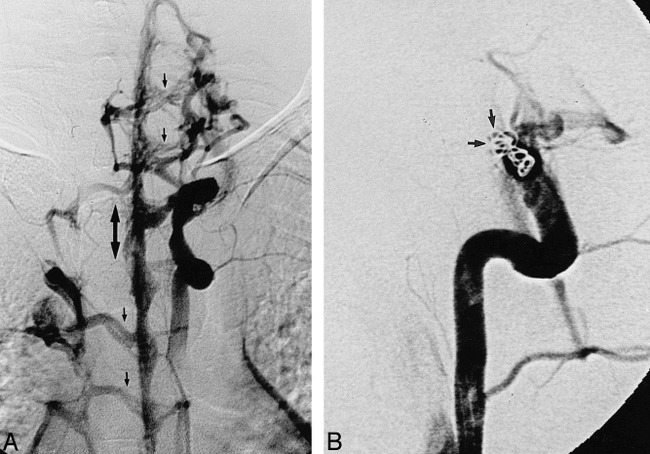 Angiography performed in these patients showed large PVAVMs with multiple feeders, which were treated by a combination of transarterial and transvenous embolization. One of the seven patients had an associated spinal cord arteriovenous malformation. In three patients with incidental PVAVMs, cure was achieved by using a combination of coils and liquid adhesives by the endovascular route. CONCLUSION: The clinical presentation of PVAVMs is variable, and symptomatic lesions are the result of compression by epidural veins or of congestive myelopathy. A clear understanding of the anatomy and pathophysiology is necessary to plan treatment. Endovascular techniques are capable of curing the malformation, alleviating the symptoms, or both in a significant proportion of these lesions. Arteriovenous malformations (AVMs) of the spine and spinal cord can be categorized as spinal cord AVMs, spinal cord arteriovenous fistulas (AVFs), dural AVFs, and AVMs occurring outside the dura but draining into the epidural veins. The last group may be called paravertebral AVMs/AVFs (PVAVMs/PVAVFs). Vertebro-vertebral AVFs have also been categorized by some authors as PVAVMs (1). Cobb syndrome represents a unique entity in which a PVAVM is associated with a spinal cord AVM (1). Most spinal cord AVMs or spinal cord AVFs present acutely with a neurologic deficit caused by an incident of bleeding or with a subacute neurologic deficit (1). Dural AVFs, which are the most common of the spinal vascular malformations in adults, present with slowly progressive myelopathy as a result of venous hypertension in the spinal cord (1–3). The MR manifestations of spinal AVMs vary according to the pathologic finding, location, and extent of the nidus and the type of venous drainage pattern (2–4). There is abundant literature regarding spinal cord AVMs, spinal cord AVFs, and dural AVFs (1–3, 5), but the literature on PVAVMs is limited to case reports and case series (1, 6–18). We retrospectively reviewed the records of 10 patients with PVAVMs who received treatment at our hospital to correlate the clinical presentation with the imaging features and to set guidelines for therapy based on our treatment results. We excluded vertebro-vertebral AVFs from this series because they represent a distinct group in regard to clinical presentation and treatment. The clinical records and images of 10 patients with PVAVMs were reviewed retrospectively. These patients underwent exploration, or received treatment, or both at our institution between 1984 and 1998. They were from a series of 103 patients with spinal vascular malformations who underwent exploration or received treatment at our hospital. Our analysis included clinical presentation, MR findings, angioarchitecture, pathophysiology, treatment techniques, treatment efficacy, and clinical follow-up. The results of the MR examinations were available for nine of the 10 patients, and the results of the angiography were available for all 10 patients. Eight patients underwent some form of treatment, whereas two patients were found to be unsuitable for any form of treatment. Whenever endovascular techniques were used for treatment, the right femoral artery or vein was used for access. Coaxial catheter systems with different microcatheters were used. In all cases except one, a microcatheter was used for embolization. Embolization was performed using coils, or liquid adhesives, or both. Liquid adhesive consisted of an n-butyl cyanoacrylate (NBCA)-lipiodol mixture in varying proportions with or without tantalum. One patient presented to this hospital after receiving partial treatment elsewhere; the records of that treatment were unavailable. The clinical presentation, MR findings, angioarchitecture, and results of treatment for the 10 patients with PVAVMs are presented in the Table. There were seven male and three female patients with ages ranging from 1 to 73 years (mean, 33 years). Seven patients had symptoms referable to the CNS due to direct compression of the spinal cord by a venous pouch (n = 3) or as a result of venous hypertension due to epidural radiculomedullary reflux (n = 3) or a coexistent intramedullary AVM (n = 1). It was not possible to differentiate congestive myelopathy from compressive myelopathy on the basis of clinical findings. One patient presented with a bruit. One patient presented with symptoms related to a mass in the conus, and the AVF was found incidentally. Patient 5 had neurofibromatosis. CT showed the presence of an epidural mass extending through the neural foramen. This patient underwent surgery with a provisional diagnosis of a neurofibroma, but a vascular lesion was discovered. Patient 2 had a remote history of trauma to the neck. One patient presented with an ulcerated flank mass that was found to be in the vascular territory of a high-flow PVAVM. MR findings were available for nine of the 10 patients. The T2-weighted images of two patients showed prominent perimedullary vessels and increased signal within the conus with cephalad extension. One patient had prominent perimedullary, epidural, and paravertebral channels within the thecal sac and cord hyperintensity on the T2-weighted images (Fig 1A and B). One patient had a nidus within the cord and a network of vessels within the adjacent epidural space, paravertebral space, and bone. One patient (case 8, Fig 2A) had a tumor in the conus, a tethered cord, and a large epidural vascular pouch. For three patients, MR imaging showed dilated epidural veins compressing the cord with multiple flow voids in the paravertebral region (Fig 3A). For these three patients, there was no alteration in the cord signal on the T2-weighted images nor were there excess perimedullary flow voids. One patient (case 7) had prominent epidural and paravertebral flow voids but no evidence of cord compression. A, Sagittal T2-weighted image obtained through the lower thoracic spine shows hyperintensity within the cord and the presence of multiple flow voids on the surface of the cord (arrows). B, Axial T1-weighted image obtained through the lower thoracic spine shows the presence of multiple flow voids (arrows) in the epidural space and extending into the paravertebral space. C, Angiogram with injection into the left T9 intercostal artery shows the PVAVM draining into the epidural vein. Reflux into the perimedullary veins is clearly seen (arrow). A, Midsagittal T2-weighted image obtained through the lumbar spine shows the presence of an intramedullary mass in a low-lying cord. Additionally, a round hypointense lesion is seen opposite the L5 vertebral body (arrow). B, Flush aortogram shows the feeding artery (arrow) to an epidural AVF and the venous pouch draining the AVF. Case 5. The patient has a large PVAVM and had undergone multiple arterial embolizations with NBCA. A, Coronal T1-weighted image shows multiple flow voids in the paravertebral space with large epidural veins compressing the thecal sac (arrows) and pushing it to the contralateral side. B, Angiogram (injection into right T9 intercostal artery) shows a complex AVM partially treated with liquid adhesives from the arterial route. C, Postembolization follow-up angiogram obtained through the left T9 intercostal artery shows residual AVM with reduced flow and the unaffected anterior spinal artery (arrow). Spinal angiography was performed in all 10 patients and showed arterial supply to the spinal cord. The spinal cord supply was well shown in all cases. The locations of the PVAVMs were cervical (n = 1), thoracic (n = 6), thoracolumbar (n = 1), and lumbar (n = 2). There was no predilection to any side. Two of the three patients who had increased signal within the cord on T2-weighted images and increased vessels in the perimedullary space each had a paravertebral AVF with reflux into perimedullary veins (Fig 1C) in addition to drainage to the azygos system. There was no angiographic evidence of obstruction to the azygos system. In both cases, the fistulas were high-flow with the bulk of the flow through the azygos system and minor reflux into perimedullary veins. In these two patients, the radicular vein was clipped surgically, which alleviated the symptoms. In the third patient, although reflux could not be seen on the angiogram, the venous hypertension within the spinal cord was presumed to be due to a hemodynamic obstruction of the drainage of the spinal cord by the presence of high pressure in the epidural veins. Because the reflux was not shown and the angioarchitecture was complicated, no treatment could be offered to this patient. The patient is being followed up, and repeat angiography has been scheduled. Three patients had compressive myelopathy due to large epidural veins. These three had high-flow epidural and paraspinal AVMs with multiple feeders. In two of these patients, multiple arterial embolizations were performed, resulting initially in technical success; however, residual shunting remained (Fig 3B). These treatments resulted in transient clinical improvement, but the collateral arteries were enlarged on the follow-up images. One patient (case 10) experienced deterioration in clinical status after arterial embolization was performed at an outside institution. Subsequently, transvenous embolization was performed using coils in all three patients. In cases 5 and 10, the azygos vein was catheterized to gain access into the epidural pouch. One patient (case 2) had a cervical epidural pouch that was accessed through the vertebral vein. Transvenous embolization using coils resulted in a significant benefit in case 2 and minimal improvement in the other two patients. In three patients (cases 6, 7, and 8), the arterial access was large and accessible. One patient (case 8) underwent successful embolization with liquid adhesives, resulting in obliteration of the fistula (Fig 2B). The angiographic features in another patient (case 6) suggested that the vascular mass had probably resulted from a diversion of blood from the fistula subsequent to thrombosis of the hemiazygos system. This fistula was closed using coils and liquid adhesives from the transarterial approach. The third patient (case 7) had a large paraspinal fistula (Fig 4A) draining into the epidural veins. Because the epidural venous plexus lacks valves, the drainage occurred both cranially and caudally (Fig 4A). Cure was achieved transarterially using coils (Fig 4B). A, Angiogram obtained with the catheter in the left supreme intercostal artery shows an epidural fistula (small arrows) draining into the epidural veins. The epidural venous plexus drainage is bidirectional (large, double-headed arrow). B, Embolization was performed with coils (arrows) using the arterial route. Postembolization angiogram, oblique view, shows complete obliteration of the fistula. Embolizations were performed with coaxial systems using microcatheters of variable stiffness, except during the venous embolization in case 2, for whom a 5F catheter was placed into the epidural vein to allow deployment of larger coils. The liquid adhesive used was n-butyl cyanoacrylate (NBCA) diluted by lipiodol in varying concentrations. Tantalum powder was used for further opacification of the NBCA-lipiodol mixture. There were no significant procedurally related complications. In case 6, a transient gait abnormality occurred after transarterial embolization was performed; the abnormality was likely due to thrombosis and enlargement of the large epidural pouch, resulting in cord compression. In each of the three patients (cases 2, 5, and 10) in whom a large mass of coils was deposited into the epidural space, there was no deterioration in neurologic status. PVAVMs are rare lesions that have diverse presentations and imaging features. It is important to understand the pathophysiology of these lesions to plan appropriate treatment. A PVAVM can produce venous congestive myelopathy similar to that of a dural AVFs or compressive myelopathy as a result of enlarged epidural veins. Some PVAVMs are detected incidentally. All three presentations have been described in the literature. 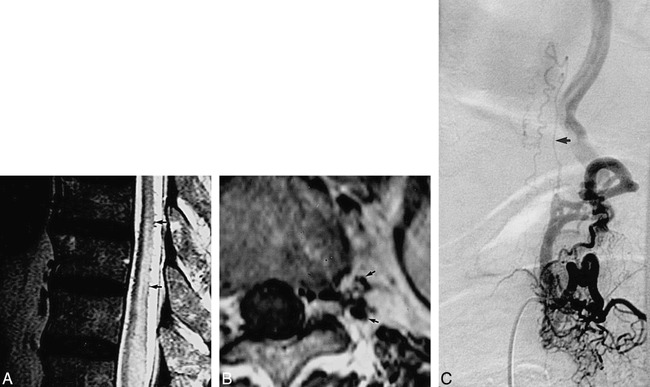 Hui et al (6) described three cases of paraspinal AVMs in which one patient presented with myelopathy due to the mass effect of the veins, one presented with a bruit, and the third had an AVM draining into the perimedullary pial network resulting in congestive myelopathy. Arnaud et al (7) described a case of a PVAVM with congestive myelopathy due to reflux into the perimedullary veins at two levels. Cognard et al (10) described a posttraumatic paravertebral presacral fistula with perimedullary venous drainage. In our series, three patients had symptoms and imaging features suggestive of dural AVFs, and perimedullary reflux was observed in two patients. Compression by large epidural veins was the cause of symptoms in three of our patients. One patient had Cobb syndrome with an intramedullary AVM in addition to the PVAVM. The symptoms in this case were most likely due to the intramedullary component. One patient presented with a vascular flank mass. Imaging revealed that a PVAVM was draining into the flank mass, probably secondary to obstruction of the azygos system. Two of the lesions in our series were detected incidentally, one with a bruit and the other during the workup for spinal dysraphism. The association between neurofibromatosis and epidural AVF, as observed in one of our patients (case 5), has been described (15). Perimedullary reflux from a PVAVM, observed in two of our cases, is uncommon. Manelfe et al (19) described the existence of glomerulus-like structures within the two layers of the dura. These are thought to function in the maintenance of constant venous pressure in the spinal cord regardless of changes in intraabdominal or intrathoracic pressure (20). Merland et al (20) noted a striking resemblance between the glomerulus reported by Manelfe et al (19) and a dural AFV. Tadie et al (21), using histologic sections, showed narrowing of the radiculospinal veins at the point at which they crossed the dura. At that point, the vein loses its own wall, which is replaced by an arachnoid cuff and by the dura itself. Tadie et al (21) postulated that under normal physiological conditions, the narrowing and zigzag course of these veins oppose any blood flow from the periphery into the intradural space. Alternative theories have also been suggested for the maintenance of constant venous pressure in the spinal cord. Suh and Alexander (22) suggested the presence of a monocuspid valve at the points of junction between veins of the third and fourth order. Gillilan (23), however, could not find the existence of the “monocuspid valves” on histologic sections. She thought that the vessels of capillary size, which make up the plexus of the gray matter, open abruptly into venules of comparatively greater diameter, which would tend to accelerate the flow of blood into the venous side of the circulation. Although we offer no hypothesis regarding the pathogenesis of the PVAVM, we think that reflux into the perimedullary veins occurred as a result of failure of the antireflux mechanism owing to the presence of chronic venous hypertension in the epidural space. Why it develops in only some patients and not in others is probably best explained by the existing pathways of venous drainage of the cord, the patency of the azygos system, and the size of the shunt. The radicular veins draining the spinal cord usually open into the spinal nerve venous channels when these exist at the neural foramen. Alternatively, they may drain into the epidural venous plexus (24). Often, the epidural venous system has segmental communications with the spinal nerve venous channels (23). With available angiographic techniques, it is not possible to precisely delineate the venous drainage of radicular veins in an individual patient. However, we hypothesize that in patients with reflux into the radicular veins, anatomically, the radicular veins were draining into the epidural venous plexus whereas in the other patients, even though the epidural veins were grossly dilated, venous hypertension of the cord was not produced because the radicular veins were draining by an alternative route that was not interconnected with the epidural veins. To the best of our knowledge, the MR features of PVAVMs have not been described previously. These will depend primarily on the location of the nidus and the venous drainage pattern. Hyperintense signal within the spinal cord was seen on the T2-weighted images of three of our patients, as was an increase in perimedullary flow voids and, hence, simulated spinal dural AVFs. Additional vascular channels in the vertebra or paraspinal space were observed in one of the three patients, consistent with the paravertebral location of the AVM. In the other seven patients, prominent vessels were observed in the epidural space or in the bone. Careful scrutiny may be required to detect these abnormal vessels. Coexistent intramedullary lesions, such as those that occur in association with Cobb syndrome, should be looked for. The MR examination should include the entire spine. The parasagittal plane is useful for evaluating the paraspinal region, and axial and/or coronal images should be obtained through suspicious areas. Visualization of the perimedullary and radicular veins may be possible with the use of contrast-enhanced 3D MR angiography in patients with spinal dural AVFs (25), although we have no experience with this technique. The angiographic evaluation of a PVAVM includes obtaining a complete spinal angiogram to determine the arterial supply to the AVM, the site of the shunt, and the venous drainage. Reflux to the perimedullary veins should be searched for, especially in patients with flow voids in the subarachnoid space and increased signal within the cord on T2-weighted images. Knowledge of the supply to the spinal cord will reduce the risk of an arterial embolization and may provide evidence of venous congestion of spinal cord circulation (26). Reports on the treatment of PVAVMs are anecdotal (1, 5, 6, 9, 11). Hui et al (6) treated two patients with paraspinal AVMs with arterial injections of liquid adhesives. In one patient, these injections were performed after transvenous deposition of coils. The diverse morphology and variable clinical effects of PVAVMs necessitate an individualized approach to treatment. When a patient presents with venous congestive myelopathy due to reflux into a radicular vein, the most appropriate treatment is surgical clipping of the radicular vein adjacent to the fistula. This produces alleviation of symptoms; however, it does not treat the AVF. This strategy has been used in the treatment of spinal dural AVMs and intracranial dural AVMs with cortical venous reflux (27). The treatment strategy for intracranial lesions is based on the benign course of the disease in patients who have no cortical venous reflux. Owing to the rarity of the disease and the paucity of reported cases, the natural history of PVAVMs is unknown. Hence, our patients in whom the radicular vein has been surgically clipped are being followed up at our clinic. The treatment of a symptomatic high-flow PVAVM with multiple feeders remains a challenge. Such a lesion often extends over multiple spinal levels and does not have a well-defined nidus. Embolization of the feeding arteries without complete obliteration of the draining vein led to further recruitment of feeders in three of our patients, making subsequent treatment more difficult. The intention of treatment should be to occlude the draining vein at the site of the fistula completely. If there is a large fistula, it may be possible to reach the venous pouch from the transarterial route to allow deposition of coils into the vein. This meshwork of coils can facilitate the safe, accurate transarterial deposition of the liquid adhesive at the site of the fistula. Alternatively, it may be necessary to deliver a meshwork of coils into the epidural venous pouch from the transvenous route, as was done in three of our patients. The epidural venous plexus was accessible from the venous route in the cervical region in one patient and the thoracolumbar region in two patients. Arterial embolization alone without penetration of the fistula results in ligations, promoting enlargement of collateral arteries and making subsequent treatment more difficult. In our experience, a cast of liquid adhesives or the presence of coils within an epidural vein does not produce symptoms of cord compression. The experience of Lasjaunias (2) and Hui et al (6) has been similar. Symptomatic PVAVMs can present with either congestive myelopathy or compressive myelopathy, which cannot be differentiated on clinical grounds. Treatment of PVAVMs, whether surgical or endovascular, requires a clear understanding of their pathophysiology and anatomy and is directed toward elimination of the venous expression of the disease, which is usually responsible for the clinical symptoms. ↵1 Address reprint requests to Robert A. Willinsky, MD, Department of Radiology, Toronto Hospital, Western Division, 399 Bathurst St, Toronto, Ontario, Canada M5T 2S8. Accepted after revision January 8, 1999.